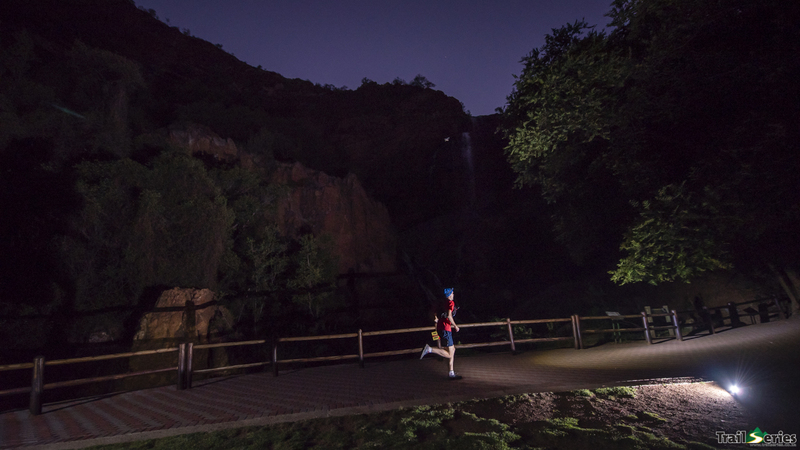 As so it was as civil twilight faded to darkness, we released the brave onto the tracks and trails of the magnificent Walter Sisulu Botanical Gardens in race 3 of the Gauteng Summer Trail Series®. The weather for running could not have been more sublime, with clear skies and a chilly breeze keeping the body temperature down on the big climbs! For both the 11 and 5 km routes it was the same first 2.2km, up up and up...180m of it to be precise. Past the waterfall and onto the ridgeline above. From the split it was more rocky trails for the 11km runners and a steep descent back onto the garden trails for the 5km. At the finish line the hills looked for all like fairy lights on a Christmas tree as the snake of runners made their way around their respective routes. There was a special treat near the end with a duck through the bird hide and surrounding forests, adding that eerie feeling to an otherwise open sky run! Two familiar faces appeared out of the darkness to break the tape in their respective courses, Bernard van der Kuil winning the 11km in 58:57 and Tiaan Dorfling (14 yrs) winning the 5km in 26:10. Bernard was chased hard by Craig Makapela who came in just over a minute behind. Matthew Bodenstein also gave Tiaan a hard push in the 5km, finishing less than a minute back. Piers Pirow and Stuart Phipson (14 yrs) rounded out the podium in the 11 and 5 km respectively. Marelize Retief took her seemingly million candle light lighthouse headlamp for a run and as usual gave majority of the 11km field a lesson in uphill running, closing out at the turn in 4th place overall. Marelize finished in 7th overall in 1:04:04. Michel Botha ran in second in 1:13:39 and Michaela Sra’Krova took third just under a minute back. 14 year old Thina Makapela took charge of the ladies race in the 5km, finishing 13th overall in 36:32. Leanri Williamson took second in 38:56 and 12 year old Lana Classens in 3rd in 40:08. 25 kids under the age of 14 years took to the dark trails, relishing in this adventure! Special shout out to our youngest runner, 7 year old Emma Greubel, finishing 79th out of 102 runners and only 35 seconds behind the second youngest runner, 8 year old Riche Jonas. Up front however it was the usual all guns blazing with the top four in the ‘Peewee’ category (<10 year of age) all finishing within a minute of each other. Scott Williamson (10 yrs) took line honours in 32:38, with Reece Hodgkinson and Hayden Currie in hot pursuit. In the 11-14 year ‘Minimee’ category 11 year old Lean Scholtz rounded out his category podium in 30:13 (and a 4th place over the line! ), preceded only by his fellow speedsters Tiaan Dorfling and Stuart Phipson. Concluding the GSTS18 is the final run out at a crowd favorite - the magnificent forests and bushveld trails of B’sorah! It’s on like donkey kong this Sunday, 11th Nov. Don’t miss out and either pre enter on Trail Series® or on the day. Registration opens at 5am with race start at 7am. A huge thank you to Walter Sisulu Gardens and of course all our power sponsors, Jaybird, Raidlight, Pepsi Max and Petzl! The Trail Series® is proudly brought to you by Wildrunner. A little further out of the Cape, and a little later in the evening, Race 3 at Meerendal Wine Estate had all the ingredients of the perfect date. Pink sky, good tunes, good food, wine and twinkling lights. You could forgive MC Sean Robson for encouraging runners to look around for their singletrack soulmate on the start line… ‘Tis the month of love, after all. Meerendal is usually the hallowed ground of mountain bikers, but was all ours for the evening. A course that includes a couple of rollercoasters and some infamous switchbacks along with smooth tracks designed for speed and fun. Warnings of numerous snake spottings on the course were relayed to the runners as they lined up, but that didn’t seem to slow the fast crew at all. As the Series® leader board takes shape, so the competitive edge sharpens. There was certainly no bromance between Dylan Stevenson, Jono Black and Oriole Bolus as they headed out on the long course. Although Dylan let Jono get ahead of him for a while (to clear snakes off the path, he says) he caught him around half way to take the win in 52:30. Jono followed in 55:20, with Oriole of the infamous Muizenberg Trail Dawgs (we know this because they wear t-shirts that say so) rounding out the men’s podium in 57 minutes. Katja Soggot was untouchable in the women’s race, finishing in 1:01:40, with Julie Huckle second in 1:10:16 and Zoe Homel third in 1:13:08. In the short course, we once again had some exceptional performances from our PeeWee and Minimee categories and we look forward to watching these names as the youngsters mature in to their trail running careers. Bronwyn George (19) flew in to the finish chute at a blistering pace, taking the win in a time of 24:26. 15 year old Cole Adams was 30 seconds behind him, followed by Cobus Hugo in 25:14. Tanya Posthumus-Fox secured her overall Series® win in a time of 28:12, followed by Bianca Tait, also first vet, in a time of 30:04. Rosslee Guess, who has performed consistently well throughout the series finished third in 30:15. Other notable performances from the evening included 14 year old Jethro Dunn who topped the Minimee podium in a time of 25:53, as well as 10 year old Cullen Clark who scooped the PeeWee win in a time of 28:35. Prize giving became its usual performance made up of trail banter, great prizes and the Muizenberg Trail Dawgs cracking open a Tafel Lager or two as the last of the twinkling lights came down to the finish line. What comes next, is an exciting decision making process. If you are happy with your 3-out-of-4 race results, why not upgrade to the XL at Oak Valley on 25 February? 25km of absolute trail stoke in a breath taking venue, and a great way to finish off what has been a truly excellent Series® so far. With thanks to the great brands and businesses that add so much to each event; Raidlight, Peak Performance Fitness, Steenberg, Mountain Dew and WWF. 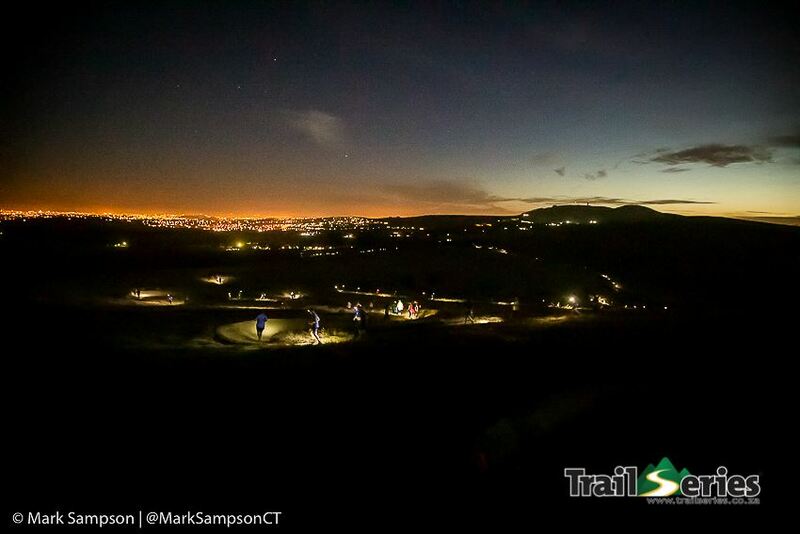 A selection of images is on our website, with many more on the Trail Series® Facebook page! Full results are here.